High-value assets such as power transformers are routinely kept in service beyond their nominal lifetime. Strategic asset management takes an analytic-centric approach in order to safely and efficiently accomplish this. There are many dimensions to asset analytics. From a planning and procurement perspective, the repair vs. replace decisions for such assets is driven by risk-management calculations. From a maintenance perspective, optimizing the maintenance program requires an accurate assessment of the asset condition, which is made on the basis of asset health analytics. From an operational perspective, balancing of use-related deterioration against revenue is a key aspect of maximizing efficiency of the system. The relevant standard for implementing strategic asset management is the international standard ISO 55000, which specifies an asset management approach that is iterative and arises from the organizational objectives, is embodied in a strategic asset management plan, and incorporates performance evaluation so that its ongoing contributions to the organizational objectives can be affirmed. This enables the use of best practices in asset management and provides for consistent outcomes. This data needs to be brought together and expressed in a common format. The relevant standard to enable this data engineering is IEC 61968-4 on “Common Information Model (CIM) for Asset Management.” This standard provides the data model that enables the various utility systems express their data in a commonly understood manner, both in semantics and syntax. In essence, through the use of this standard, the utility systems all speak the same “language” and an asset risk analytic system can easily take and process such data without human intervention. 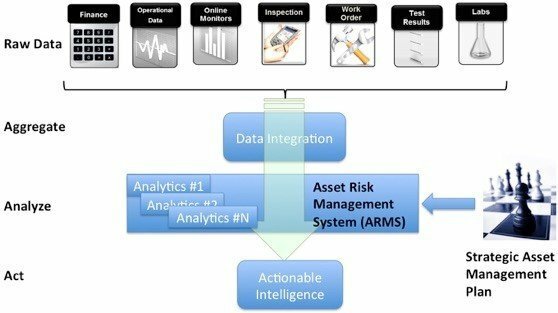 Furthermore, the IEC 61968-4 standard enables the output of the asset analytic platform, such as health and risk scores, and asset health notifications, to be communicated in a standardized manner that can be understood by systems such as WAMS that may create a work order on the basis of such information. The use of these international standards should be the foundation of asset management in utilities. In Doble’s experience, these standards represent the essence of decades of asset management lessons learned and embody best practices. The benefits of standards-based asset management and analytics include cost savings and better results. The Doble Enterprise Asset Management Solutions leverage international standards to deliver best-in-class performance in a cost-effective manner.